Mitch Hedberg would be 48 today, but, unfortunately, not all of his fans can get up to Minnesota to leave a donut and a receipt on his grave. 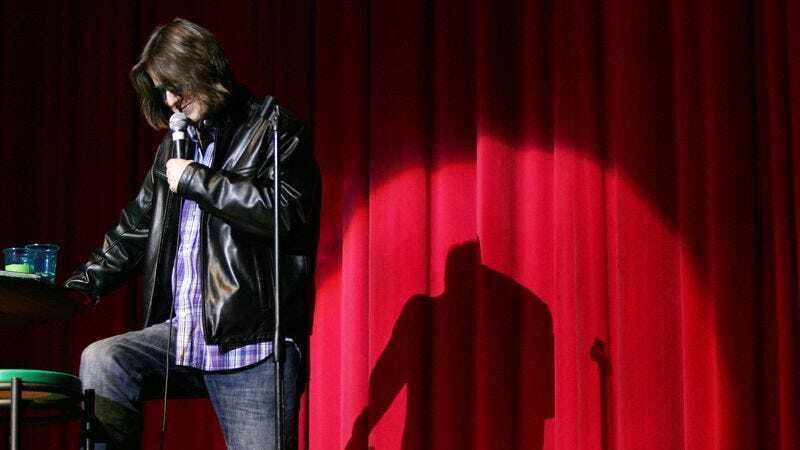 There are plenty of ways to remember him online, however, from a short documentary Hedberg’s wife made about the late comedian’s writing process to an excellent piece Vice ran last year asking comedians like Marc Maron, Chris Cubas, Hannibal Buress, and Emily Heller to chat about Hedberg’s lasting influence. AVC: Are you and your wife going to have kids and take them on the road with you? Raise them to be comics? MH: I would love to have kids, but, uh… I was doing some shows up at the Montreal comedy festival a few weeks ago, and one of those other comics had their kids backstage. And the backstage area is a pretty fun area. It’s where you wind down, and you can do some things. I was lighting up a pipe—a tobacco pipe, of course—and my wife was smoking, and when the baby would come around, we’d kind of hide ‘em behind our backs and say, “We’re sorry, we’re sorry.” And they’d say, “Aw, don’t worry, we don’t care.” But we care! This is a baby, man! C’mon, you know? It was weird. I would never want to impose that on any other guy who’s in his holy zone of backstage before the show. If I had kids, they wouldn’t get a pass backstage. Kids are in the future. There’s no doubt about it. I just don’t want to write kid jokes yet, really, and that’s a guarantee. Even some of my favorite comedians have kids and then immediately write kid jokes. That’s the fastest fall I’ve ever seen in comedy, subject-wise. All three of Hedberg’s comedy albums—Strategic Grill Locations, Mitch All Together, and Do You Believe In Gosh?—are available in their entirety on YouTube. They’re pasted below, for your convenience, along with some other classic Hedberg clips.